"If you are serious about transporting liquids then Liquid Load by Ajay is your answer." An exciting new range of liquid transporters has just hit the market. 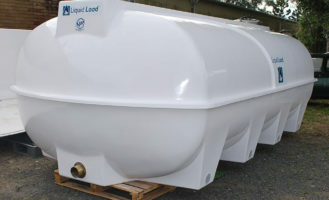 The all new Liquid Load tanks are second to none. If you are serious about transporting liquids then Liquid Load by Ajay is your answer. Transporter tanks are not new for Ajay Fibreglass as we have been manufacturing our original range of liquid transporters for 33 years so the many years of experience brings you peace of mind. Our all new Liquid Load tank are second to none. The Liquid Load range are fully engineered and comply with all Australian load restraint regulations. This sets the range in a category of its own! The tanks are fully baffled, self-draining and ready to bolt down to your chassis. If you are serious about transporting liquids then Liquid Load by Ajay is your answer. Transporter tanks are not new for Ajay Fibreglass as we have been manufacturing our original range of liquid transporters for 33 years so the many years of experience brings you peace of mind.